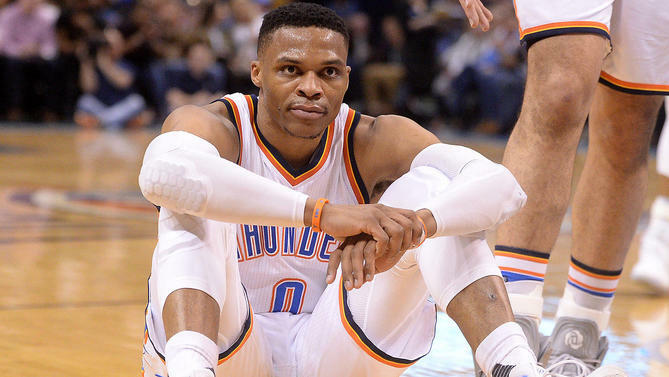 Years from now, it won’t matter that the Thunder finished in fifth or sixth or seventh place in the West. Anyone looking back on this NBA season will want to talk about Russell Westbrook first, and anyone who watched it unfold as it happened will happily oblige them. What Westbrook’s doing now will make even less sense later. The other night he put up 57 points, 13 rebounds, and 11 assists, hit a game-tying three to send it into overtime, and won it at the end. I watched it live, cackling in my living room. Now it’s awards season across the NBA. I wrote about Kawhi’s MVP case a few weeks ago, and Ben Golliver wrote about James Harden’s MVP case earlier this week. And if it’s time to talk about commemorating this Westbrook season, I think we should be clearer about what we’re celebrating. Westbrook’s season has me torn as a basketball fan. I think it’s less because of him, and more because of the way other basketball fans talk about him. We spent the last six years watching smart basketball fans treat Kobe Bryant like a war criminal because of his shot selection, but suddenly Russell Westbrook is indisputably more valuable than anyone in basketball? It doesn’t track. The triple double implies a well-rounded game by its very terms, but there’s been nothing well-rounded about Westbrook in 2017. He plays almost no defense. He dominates the ball to a historic extent. His passing is perfunctory—he’ll distribute the ball until he has double-digit assists, and then perfectly-decent role players like Victor Oladipo are transformed into frozen bystanders as the game unfolds. By design, many of his rebounds come off free throws, and some of them come after uncontested shots as Westbrook abandons his man to chase the boards—read this Reddit breakdown for more. All of this has made it harder to be blown away by his triple doubles. And yes, he’s an unbelievable scorer who’s been even better in crunch time, but even that story can get complicated. As he locks into hero mode, teammates eventually become too checked-out to help him at the end, forcing him to do even more. The real genius of Russ is this: his style in 2017 makes no sense for an individual or a team, but he’s doing it so well, playing so hard, that he’s mostly successful anyway. Every time I’ve been ready to officially write him off this season—down 13 in the fourth quarter against the Mavs on Monday, down 21 with seven turnovers against a tanking Magic team on Wednesday—Westbrook will go off and do something that makes criticism impossible. He creates skeptics, and then silences them. Against the Mavs, it meant scoring 12 of the final 14 points, including a game-winner. Against the Magic, he scored 19 points in the final eight minutes of the fourth quarter, including the aforementioned game-tying three—a full-speed fast break that turned into a leaning heave from 28-feet, all net. The fourth quarter ended with MVP chants erupting across the entire Orlando crowd. After Westbrook closed it out in overtime, even Magic players were paying respect. Back to the MVP debate. A Harden voter might note that Houston’s MVP candidate hasn’t had as many heroic moments in crunch time because his team wins most games by double digits. The Rockets beat the Magic by 24 in February and beat the Mavs by 16 at the end of December. They also beat the Thunder on Sunday—Westbrook finished with 39 points next to Harden’s 22, but OKC was down 25 by the time the fourth quarter began. While Westbrook makes his task look impossible and finds a way to succeed, Harden makes the game easier for his entire team, and he’s been more successful than Westbrook. Maybe that’s where the debate should end. At this point, a Westbrook voter could make two arguments. First, it’s disingenuous to say that Harden alone explains the Rockets success. Houston’s been built with a series of pieces that fit perfectly with where basketball is going, and Mike D’Antoni is the perfect coach to weaponize them. Harden is incredible and arguably the best player in the league to capitalize on this supporting cast and embrace basketball’s new direction, but were he left working with Victor Oladipo and Steven Adams, it’s unlikely he’d be putting up 11 assists per game and pushing 50 wins. So, fine. It’s possible go through every MVP candidacy and cherry-pick context that pokes holes in the narrative. For example, Westbrook’s roster is worse because the second-best player in the NBA decided he didn’t want to play with him any more. How much should that count in value discussions? Likewise, if Westbrook and Harden switched places, OKC is likely still a similarly situated playoff team, while Houston is probably 5-10 wins worse. We could do this all day. It gets old quickly. The second Westbrook argument is the one I find more compelling. Basically, most smart people can acknowledge that Westbrook’s the antithesis of basketball’s recent evolution. He’s a video game in real life, and that’s both a compliment and a criticism. As incredible as his numbers are, the OKC offense is as creative as something a 12-year-old gamer would come up with, and it shows when they play teams like Houston and Golden State. But even then, Russ’s biggest critics can’t deny that this has taken on a life of its own. Every time the cracks have begun to show and it looks like this season will fall apart in OKC, Westbrook gets even better. The Thunder dropped four straight at the beginning of March, but then they came back and beat the Spurs, the Jazz, and blew out the Raptors. OKC went down double digits in Orlando and Dallas, and then Westbrook brought them back from the dead. It’s happened so many times this season that it’s not a fluke anymore. This is the formula, and it’s working better than most anyone could have expected. It’s captured the imagination of his teammates and opponents alike, not to mention anyone who stumbles upon a random Thunder game at 10:30 PM in the middle of the week. And if awards don’t exist to commemorate athletes and seasons that capture our imagination, then why are we doing any of this? Even if 2017 Westbrook is way more Kobe than LeBron, that doesn’t have to be a criticism. I loved Kobe, even as he turned into the Mad King late in his career. Basketball is more interesting with a few psychopaths around who refuse to compromise. For me, the only Kobe qualifier was that I drew the line at pretending he was the flawless savior that Lakers fans believed he was. Of course he wasn’t infallible. He was a lovable crazy person who was just great enough to make it worthwhile for his team to endure someone that exhausting. That’s how I see Russ. He is our new Mad King. He’s not the best player in the NBA. He’s not even the best point guard. If I wanted to build a title team with multiple stars, I’d take Steph Curry over him every time (and possibly John Wall). Technically speaking, James Harden has been every bit as valuable to a better team this season, and Kawhi Leonard probably has been as well. LeBron James is still the most dominant player alive. But maybe none of that should matter if the goal of an award is to document what it was like to watch basketball during a given season. As of this week, Westbrook’s season is so outrageous that any award he gets, he deserves. Whatever flaws he has, it just can’t be overstated how incredible he’s been. He entered the year with comic–book hype for what he might do without Durant, and he’s exceeded every conceivable expectation. It shouldn’t be possible to play this hard for six straight months, let alone do it this well. He’s had the power to win over the heart of anyone who’s watching, win game after game at the very end, silence skeptics, and somehow never slow down. Whether he wins MVP or not, what he’s doing this season will never be forgotten. And forget about the triple doubles. That power is what I will remember.